It seems that Coca-Cola actually cares a great deal about your health, at least that’s what one of the company’s latest advertisements has to say. In case you missed it, Coca-Coca came out with an advertising campaign speaking of the nation’s status on health and obesity, and how the company is producing products to help fight the obesity epidemic. In other words, Coca-Cola is positioning itself as a company who cares about your health. It doesn’t. 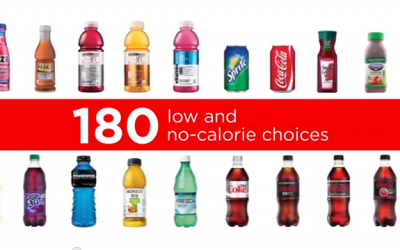 In the above advertisement, Coca-Cola explains how it can play an important role in fighting obesity, that it offers 180 low and no-calorie beverages among the 650+ total available beverages. The company stresses that the obesity epidemic is not caused simply by the calories derived from Coca-Cola products. Of course it isn’t surprising to see Coca-Cola come out with such a campaign. How else would the company protect itself against the influx of studies concluding that the company’s products are destroying the public’s health? It is no secret anymore that sodas and sugary beverages play critical roles in the development of illness and disease as a whole. The company’s move is nothing more than damage control. In addition to reacting to public resistance, it seems the company is also seeing a decline in sales – a problem that can be partially mended through a care-driven ad campaign. Coca-cola is under heavy fire, and they know it. Diet soda has been shown to cause kidney health decline, cell damage, metabolic syndrome, heart attack, obesity, and more. Soda and sugary drinks are linked to obesity on a genetic level. Kids receive 7 trillion calories of sugar from beverages each year. Regular sodas contain high amounts of sugar, and are undoubtedly a primary cause of sugar consumption. This sugar consumption leads to obesity, diabetes, cancer, gout, and a number of other health conditions. Soda often contain high-fructose corn syrup, which has been shown to contain mercury and damage learning ability.